Source: NPS, Rank among 378 National Park Units 2018. Federal - 4,778 acres. Total - 5,990 acres. There is no fee to visit Gettysburg National Military Park, the Visitor Center, or a Ranger Guided Walk. Special fees for additional items, including the new Visitor Center film, A New Birth of Freedom, the Cyclorama, the Museum, the David Wills House, and Bus Tours do apply. 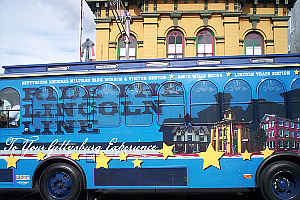 Other Bus Tours are available from concessionaires, including a Battlefield tour with guide, in car tours with licensed guides, and the Trolley Service to downtown sites and museums, the cemetery, and the High Water Mark area. These tours do require a fee. Don't miss the Gettysburg Cyclorama in the Visitor Center. Light and sound fury from the technology of the 1800s that will get you in the mood for battle walks and tours. Above Image: One of three video screens, part of the Opening Ceremony for the 150th Anniversary of the Battle of Gettysburg. July 1-3, 2013 - In many ways it's hard to describe, both just how important the Battle of Gettysburg and its Union victory were to the nation to those less initiated with its history, and how remarkable the events to commemorate the battle have been to not only sustain the history and commemorate, but to build bridges to the generations to come. As we walked across, sometimes at a double quick, the fields of Pickett's Charge, with over 10,000 men, women, and their children, some carried as infants, the remarkable scene brought out various emotions. A sadness to the realization that the men in 1863 were greeted with a hail of bullets that would take many a life and not the cheers of crowds that were commemorating them; the thought that the faces in the crowd were representative of a cross-section of the best of all generations that make up the nation they saved, and the joy and thrill of participating in such a memorable occasion. There was a bit of guilt in the latter, I must admit. The hope is, and I'm sure it will be, that those in the younger generations that had participated 150 years after the battle itself and now understood, in some small measure, what it meant and would rise to protect it in the future. There would be no United States of America in the way we think of it if the Union had not won this battle, even if they'd eventually have won the war without it. You might be using your passport to gain access to Virginia or it might have moved forward in a more cobbled fashion, not able to rise to the greatness that would mark the moments of history thereafter and hopefully going forward. And as far as the celebrations themselves, we'll go back to the word we used to first describe them, ... Wow!! July 1-3, 2013 - The Park Service did not have a great idea of how many people would cross the fields of Pickett's Charge prior to the charge itself, but when 15,000 people signed up for a brigade from the southern perspective, more than the 12,500 who actually crossed in 1863, it exceeded expectations. 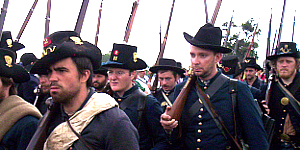 To greet them at the High Water Mark and Union lines, 20,000 to 25,000 additional spectators and re-enactors. Little Round Top - The defensive position (photo below) of the rocky precipace forever, but not at the time, known as Little Round Top would not have looked like this during the battle of Chamberlain and Vincent, (they were placed there during the night) although many boulders would have been there to shield them from the southern attackers. The heros of this end of the 2nd day battle line were Warren, Vincent, Chamberlain, and many men whose names are lesser known, both Union and Confederate, but no less important. Little Round Top - Monuments sit on the position of Little Round Top today, paying tribute to the regiments who held the position. 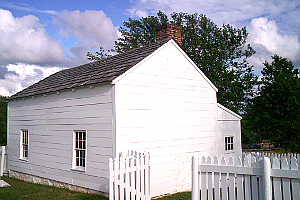 Meade's Headquarters - The Leister House, just east and below the ridge of the High Water Mark, served as headquarters for General Meade and union staff during the battle of Gettysburg, escept for the time of Pickett's Charge. During the Confederate bombardment two hours prior to the charge, the shells missed their target and went long, hitting the area of the headquarters. General Meade rode to the safety of Power's Hill for the remainder of the charge. Train Station, Downtown, and Shuttle Service - During the 150th anniversary, shuttle service to various locations around the field was added, but the Trolley Service to downtown and other sites will remain after the anniversary events are over. This year the inclusion of the Gold Line that runs from the Visitor Center to the Pennsylvania Monument to the High Water Mark and the Cemetery was added, allowing visitors to ride for free to these historic locations. Great idea for those that would like to park their car and let someone else drive. Seminary Ridge Museum - On the first day field of fighting north of town sits the newly opened Seminary Ridge Museum, held on the campus of the Lutheran Theological Seminary. Buford's cavalry used the cupola in the picture above as a lookout point during July 1, sighting the approaching Confederate troops streaming down Chambersburg Pike. Photo above: Reeanctors of Union Soldiers as they led the Iron Brigade Battle Walk during the 150th anniversary of the Battle of Gettysburg. 1. Opening Commemoration Ceremonies. A light and sound show of commemoration and creativity spanned three stages erected for just this moment on the hillside next to Meade's Headquarters off Taneytown Road. Begun by period music and followed by the national anthem sung by Trace Adkins, the event reflected a reverence to the actions of 1863 and the memories that had not been forgotten. With Charles Gibson presiding, the event included a speech by Gettysburg National Military Park superintendant Bob Kirby, who should be commended for his part in organizing the week's events, and the keynote by Doris Kearns Goodwin. A thirty minute music, image, and multiple actor play of the actions during the battle, a 21 gun salute ringing across the battlefield in darkness, and a candlelight illumination of the crowd, which processed to the cemetery, was a rare treat for the spectators there and on television. 2. The Battle Walks. Organized at three levels of interest and difficulty, these walks ranged from the hightlights of various important areas of the field on each day of the battle at 30 minutes duration to Overview Hikes in the central areas of the day and the most detailed, Battlefield Experiences, some of which may never be duplicated, that lasted two hours (Iron Brigade walk of July 1 led by reenactors who kept the public in line, see below) and sometimes under the cover of darkness (Meade's Council of War on July 2). 3. Evening Voices Programs. Each night after the night of the opening ceremony at 7:30 pm for 45 minutes, living history actors and actresses portraying soldiers and citizens led a dramatization of the day's events in the words of the people who lived it. Held on the lawn between the High Water Mark and Meade's headquarters and with the Pennsylvania monument in the background, this event was a fitting tribute and culmination of the day's activities for the people who trudged the field all day. It provided a nice coda and place to relax and learn more about the experiences of the individuals who withstood the rigors of the conflict. 4. 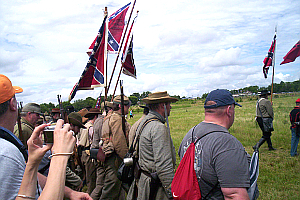 Pickett's Charge - The ultimate battle walk for most of the reenactors and participants, including many who had never been to the battlefield before. Each brigade that had crossed the field wss represented and led by custumed living history men and women representing their brigade, two park rangers, and thousands of citizens. 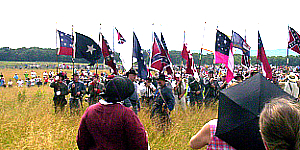 The brigades of Pickett's Division (Kemper, Garnett, and Armistead); Heth's Division (Archer, Pettigrew, Davis, and Brockenbrough); and Pender's Division (Lane and Scales) were met after the one mile charge by the Union troops of Hays, Gibbon, and Doubleday, plus their reenactors and participants. June 30 - July 3, 2013 - Check out the composite videos from the National Park Service about the anniversary events of each day. The defensive position of the Union Army of the rocky precipace now known as Little Round Top. 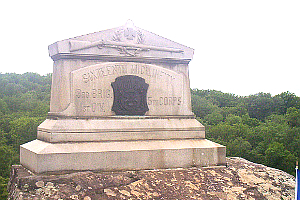 Monument on Little Round Top, Gettysburg Battlefield, today. 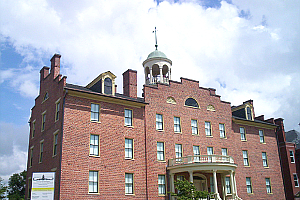 Seminary Ridge Museum, Gettysburg. Now open to visitors daily. 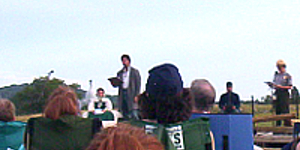 Actors reading Civil War letters during the nightly Voices program during the 150th Anniversary of Gettysburg celebrations. Even if you missed the special events of the 150th anniversary during the first days of July, you can still create your own. Gettysburg National Military Park has about 15 different Battle Walks each day of the summer season, many similar to those that were given during the 150th, including a Pickett's Charge walk about once a week or once every two weeks. You can check their website if one's coming up. Check the 3:30 Battle Walk schedule. It covers a different walk per day. The visitor center is open all year round with a museum, movie, and Cyclorama. You will pay for those. Plus, the entire town bustles with activity, most of it Civil War oriented, at all times. I know we didn't talk much about that, but it's there. The battlefield itself virtually surrounds the entire town. Photo above: Reenactors walking toward the High Water Mark from Archer's brigade and the hat and hands of new Civil War friends. Sorry for only hat and hands. Go Vols. Meade's headquarters behind the lines of Pickett's Charge. Rare glimpse inside at night during Meade's Council of War allowed during the 150th Anniversary of the battle. Civil War 150th Anniversary T-Shirts and Souvenirs. Official gifts from Americabesthistory.com. America's Best History where we take alookat the timeline of American History and the historic sites and nationalparks that hold that history within their lands. 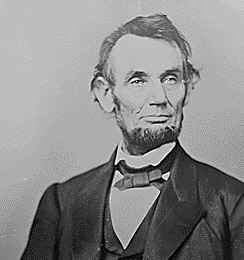 Photos courtesy of the Library ofCongress, National Archives, National Park Service,americasbesthistory.com and its licensors. If you like us, sharethis page on Twitter, Facebook, Google Plus,or any of your other favorite social media sites. ©2019 Americasbesthistory.com & itslicensors.Template by w3layouts.